An initial survey reveals that there are two RC-oscillators. The two large rectangles in the lower part are the capacitors. The driving circuit is between the caps and the resistors are the stretched structures below the caps. One of these is probably a general clock generator, while the second one could be a part of a hardware random number generator. It is also obvious that there is no counter or shift register longer than 5-bit. This does indeed seem to confirm that no LFSR is used for the random number generator. This was already suggested by the statistical analysis. Reverse engineering the exact circuit is a more involved effort, which yet needs to be done. Are you up to the challenge? 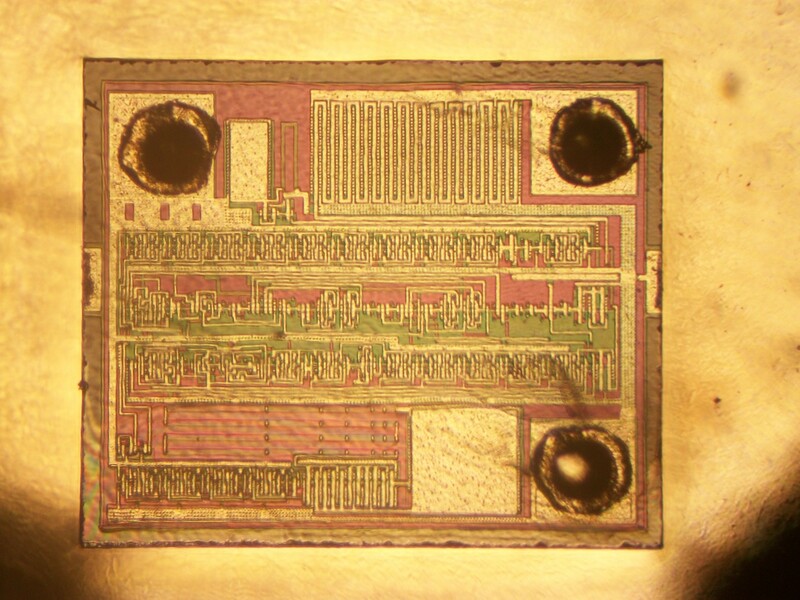 It turns out there is more than one flicker-LED-controller-chip. 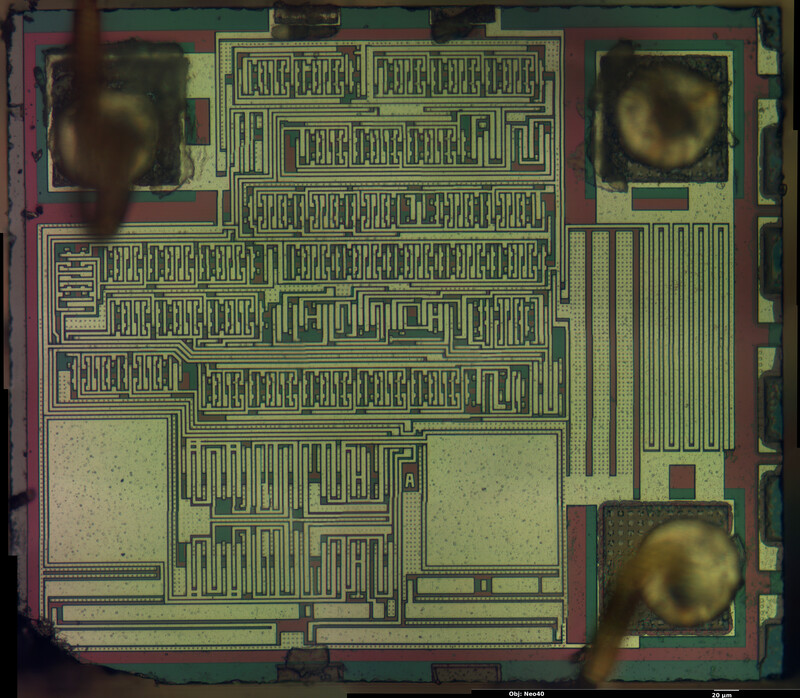 Natecaine commented on the original story on Hack-a-Day and followed up with a micrograph of the controller chip of one of his LEDs. This is a much simpler controller, as shown below. Nothing is known about the flicker-pattern so far. This controller only uses a single RC-oscillator (bottom) and several counter or shift-registers and is probably LFSR based. In other news, picatout took the code I reverse engineered from the original LED and used it to create his own Candle-flicker-LEDs by embedding a PIC10F200 into a normal LED [french]. That’s a pretty cool hack in my opinion. Of course it would also work with an ATtiny 4/5/9/10. There is one really clever solution used for implementing candle LEDs that are sometimes used, namely a music chip such as the one used in musical birthday cards etc. Instead of a piezo speaker, a LED is used and it does flicker quite convincingly modulated by the tune.